This article is about becoming a werewolf. For werewolf NPCs, see Werewolf (NPC). Werewolves are players infected with a certain strain of lycanthropy, which allows them to transform into bipedal wolf-like beasts. Becoming a werewolf adds the related skill line with which you can unlock extra bonuses. Werewolves can deal lethal damage with their claw attacks, move swiftly, and have increased health and stamina. They can also use their forearms to block and bash, similar to normal weapon use. During the transformation, they retain buffs, passive skills from other skill lines, and benefits of equipped weapons and armor, including weapon enchantments. [verification needed — Do staff enchantments proc?] 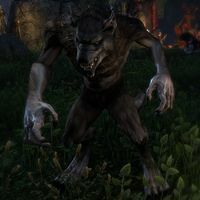 Unlike in previous Elder Scrolls games, player werewolves can still interact with most objects, change equipped armor and weapons, speak with NPCs (who generally behave normally rather than attacking or fleeing), and end the transformation at will (by using the transformation skill a second time). The main disadvantage of the werewolf transformation is that, while it lasts, the only active skills that can be used are the five from the werewolf skill line. Another significant disadvantage is the limited time on transformations, though this time can be increased by various means using the werewolf skill line. Also, the werewolf will be vulnerable for a brief time while returning to their original form. While in beast form, werewolves are also vulnerable to Poison Damage. Whether in beast form or not, they are vulnerable to Fighters Guild abilities from players who have the Skilled Tracker passive skill. You can transform into a savage beast. In order to become a werewolf, you must be infected with the disease Sanies Lupinus. There are two means of contracting this disease. One is to be scratched by one of a few special werewolf NPCs. These appear only at night, and only in a few locations. It is not necessary to kill the werewolf; once scratched, you can run away, allowing other players to contract the disease from the same werewolf. A Werewolf's Bite can also be bought from the Crown Store for 015001,500 . You do not need to do the following quest if you take this route, as the initial disease stage is skipped and the skill line is unlocked immediately. Note: If you purchase a werewolf bite from the Crowns Store, make sure that you are logged onto the character you wish to apply the bite to when you purchase it. It will only apply to that single character. The other way to contract Sanies Lupinus is to be infected by another player who is already a werewolf, and has the Bloodmoon ability. Once you have the disease and enter a nearby city, you will be approached by an NPC who senses your "blessing", and offers the quest Hircine's Gift. Upon completion of this quest, you'll gain access to the Werewolf skill tree and the ability to transform. If you instead seek a local priest, they will cure the Sanies Lupinus and you will not become a werewolf. There is one zone for each faction where both contagious werewolves and the Hircine's Gift questgiver reside. Needs more information about becoming a werewolf for each faction. The werewolf questline in Dominion lands begins in Reaper's March. The shrine to Hircine is southwest of the Fort Sphinxmoth Wayshrine. Contagious werewolves in Covenant lands are found in Northern Bangkorai. During a full moon, they spawn all along the road that leads from Troll's Toothpick Wayshrine, winds through the Viridian Woods, and ends at the gates of Pelin Graveyard. Once infected, seek out Thoreki in Evermore. The werewolf questline for the Pact begins in The Rift in the city of Riften. Thoreki is waiting near the Fighters Guild. To cure your lycanthropy, seek out Prelate Sabinus in the Mages Guild hall in Rawl'kha, Evermore, or Riften. You will be requested to donate a small amount of gold before being instantly cured. Cost: [400 / 375 / 350 / 325] Ultimate. Transform into a beast, fearing nearby enemies for 3 seconds. While transformed, your Light Attacks apply a bleed for 8839 Physical Damage over 8 seconds, your Heavy Attacks deal 50% splash damage, and your Max Stamina is increased by 30% While slotted, your Stamina Recovery is increased by 15%. Pack Leader Summons two direwolves to fight by your side. Transform into a beast, fearing nearby enemies for 3 seconds. While transformed, your Light Attacks apply a bleed for 8839 Physical Damage over 8 seconds, your Heavy Attacks deal 50% splash damage, and your Max Stamina is increased by 30%. Summon two direwolves while transformed. If killed, they return after [16 / 14 / 12 / 10] seconds. While slotted, your Stamina Recovery is increased by 15%. Werewolf Berserker Increases the damage of the Light Attack bleed. Transform into a beast, fearing nearby enemies for 3 seconds. While transformed, your Light Attacks apply a bleed for [12326 / 12326 / 12459 / 12594] Physical Damage over 8 seconds, your Heavy Attacks deal 50% splash damage, and your Max Stamina is increased by 30% While slotted, your Stamina Recovery is increased by 15%. Pounce on an enemy with primal fury, dealing [4612 / 4661 / 4712 / 4763] Physical Damage. Brutal Pounce Deals additional damage to other nearby enemies. Pounce on an enemy with primal fury, dealing [4765 / 4818 / 4871 / 4922] Physical Damage to them and an additional [2383 / 2410 / 2435 / 2462] Physical Damage to other nearby enemies. Feral Pounce Pouncing from at least 10 meters away adds additional duration to your Werewolf Transformation. Pounce on an enemy with primal fury, dealing [4765 / 4818 / 4871 / 4922] Physical Damage. Pouncing from at least 10 meters away adds [1 / 2 / 3 / 4] seconds to the duration of your Werewolf Transformation. Invoke the Huntsman's blessing, healing you for [42 / 43 / 44 / 45]% of your Max Health. Hircine's Rage Increases your Weapon Damage. Invoke the Huntsman's blessing, healing you for 45% of your Max Health and granting you Major Brutality, increasing your Weapon Damage by 20% for [17 / 18 / 19 / 20] seconds. Hircine's Fortitude Increases the healing done. Invoke the Huntsman's blessing, healing you for [57 / 58 / 59 / 60]% of your Max Health. Duration: [2.5 / 2.8 / 3 / 3.3] seconds. Roar with bloodlust to terrify up to 6 nearby enemies, fearing them for [2.5 / 2.8 / 3 / 3.3] seconds. Ferocious Roar Sets enemies Off Balance. Duration: [3.3 / 3.5 / 3.8 / 4] seconds. Roar with bloodlust to terrify up to 6 nearby enemies, fearing them for [3.3 / 3.5 / 3.8 / 4] seconds and setting them Off Balance for 5 seconds. Deafening Roar Reduces enemies Physical Resistance. Roar with bloodlust to terrify up to 6 nearby enemies, fearing them for 3.3 seconds and applying Major Fracture to them, reducing their Physical Resistance by 5280 for [7 / 8 / 9 / 10] seconds. Crush enemy with a deafening howl, dealing [8916 / 9015 / 9113 / 9210] Physical Damage. Howl of Despair Grants a synergy to allies that increases their damage done with Light Attacks. Crush enemy with a deafening howl, dealing [9210 / 9310 / 9412 / 9513] Physical Damage. Allies targeting the enemy can activate the ​ Feeding Frenzy synergy, which grants them unlimited uses of Empower for 5 seconds, increasing their damage done with Light Attacks by 40%. Howl of Agony Deals more damage to enemies that are feared. Crush enemy with a deafening howl, dealing [9210 / 9310 / 9412 / 9513] Physical Damage. Deals 30% more damage to enemies that are feared. Maul enemies in front of you with your tainted claws, dealing [3382 / 3418 / 3456 / 3491] Physical Damage and an additional [10753 / 10871 / 10992 / 11109] Disease Damage over 10 seconds. Claws of Anguish Afflicts enemies with Major Defile. Maul enemies in front of you with your tainted claws, dealing [3491 / 3529 / 3568 / 3605] Physical Damage and an additional [11119 / 11240 / 11357 / 11486] Disease Damage over 10 seconds. Afflicts enemies with Major Defile for 4 seconds, reducing their healing received by 30% and Health Recovery by 30%. Claws of Life Heals you for a percentage of the Disease Damage done. Maul enemies in front of you with your tainted claws, dealing [3491 / 3529 / 3568 / 3605] Physical Damage and an additional [11119 / 11240 / 11357 / 11486] Disease Damage over 10 seconds. Heals you for 50% of the Disease Damage done. Pursuit 3 (WHILE YOU ARE IN WEREWOLF FORM) Increases your Movement Speed by 15%. Increases the Stamina your Heavy Attacks restore by 25%. 7 (WHILE YOU ARE IN WEREWOLF FORM) Increases your Movement Speed by 30%. Increases the Stamina your Heavy Attacks restore by 50%. Devour 1 (WHILE YOU ARE IN WEREWOLF FORM) Allows you to devour corpses to increase the duration of your Werewolf Transformation and restore your Health. Every second you spend devouring a corpse adds 3 seconds to the duration of your Werewolf Transformation and restores 8% of your Max Health. Each corpse can be devoured for up to 4 seconds. Blood Rage 4 (WHILE YOU ARE IN WEREWOLF FORM) When you deal damage, the duration of your Werewolf Transformation is increased by 2 seconds. This effect can occur once every 5 seconds. 8 (WHILE YOU ARE IN WEREWOLF FORM) When you deal damage, the duration of your Werewolf Transformation is increased by 4 seconds. This effect can occur once every 5 seconds. Bloodmoon 6 Allows you to infect another player with Lycanthropy once every 7 days by returning to the Werewolf ritual site. Players already infected with Sanguinare Vampiris cannot be infected with Lycanthropy. Savage Strength 6 (WHILE YOU ARE IN WEREWOLF FORM) Increases your Weapon Damage by 9%. Increases your Spell and Physical Resistance by 5000. 9 (WHILE YOU ARE IN WEREWOLF FORM) Increases your Weapon Damage by 18%. Increases your Spell and Physical Resistance by 10000. Call of the Pack 7 (WHILE YOU ARE IN WEREWOLF FORM) Reduces the cost of remaining in your Werewolf Transformation by 10% for each transformed werewolf in your group, including yourself, up to a maximum of 40%. 10 (WHILE YOU ARE IN WEREWOLF FORM) Reduces the cost of remaining in your Werewolf Transformation by 20% for each transformed werewolf in your group, including yourself, up to a maximum of 80%. Earn kills while in Werewolf form to advance this skill line. Each kill advances your skill rank by 5 points. If you are cured of your lycanthropy, any skill points you invested in it will not be returned. To get the skill points back, you must visit a Rededication Shrine before you go to a Priest of Arkay for the cure. Any experience you previously gathered will remain allowing you to become a werewolf again at a later point without any progression lost if you choose to cure yourself. Leveling up the Active skills in the Werewolf line can take longer than expected, since you will only earn experience towards these skills while they are slotted in your skill bar, which can only happen while you are in werewolf form. The Werewolf Transformation skill itself will level even when you are not in werewolf form, so long as it is slotted (since it is an Ultimate), but the regular Active skills require you to transform regularly in order to level them. Changing the order of the Werewolf skills in your skill bar can also only be done while in werewolf form, which is problematic since you're on a limited timer before you transform back. One way to get more time to change them at your leisure (and also rack up free easy kills in order to level the skill line) is to go back and redo the werewolf starting quest, which is repeatable on a weekly basis. Once the quest completes but before leaving the Hunting Grounds, transform back into a werewolf. As long as you are in this area, there is no time limit on your transformation, so take your time choosing how you want your skills arranged, and test them out on the local respawning fauna. They're not worth much in the way of experience, but every kill counts towards leveling the skill line. The 5 item Salvation set bonus "Reduce cost of Werewolf Transformation by 33%" results in a net cost of 200 Ultimate. This page was last modified on 10 November 2018, at 11:46.